Elvis Presley grew up in the small town of Tupelo Mississippi and became one of America's greatest entertainers of all-time. Tupelo is where it all started before Elvis became the King of Rock n' Roll. You will see the humble 2 room house he grew up in with his family and how they lived modestly in the south. After being picked up from your downtown Memphis hotel, your professional driver will take you on a full-day journey roughly 100 miles (160 km) southeast of Memphis to the small town of Tupelo Mississippi, which is the birth place of Elvis Presley the King of Rock n Roll. Elvis was born on January 8, 1935 in his small shotgun house that his father Vernon built for $180 that he borrowed from his employer. 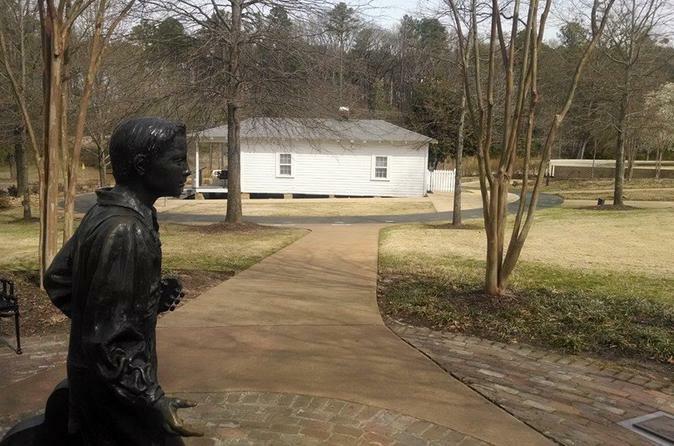 This historic museum site of Elvis Presley's includes is a museum, a chapel, and the Assembly of God Pentecostal Church building where the Presley family worshipped. The property stands in its original location and has been restored to its original condition, decorated with period furniture as well as a replica 1939 Plymouth Sedan that the family used to drive. Within the museum there are also exhibits containing Tupelo artificats, large photomurals, graphics, and audiovisual presentations focusing on Elvis when he was a boy.